First blended in the 1930's this drum is a skillful combination of malt and grain whiskies from all over Scotland. The nose is deep, balanced, elegant and smooth with hints of sweet vanilla, oak and a sensation of smoke. On the palate, it is full and complex, with vibrant honey sweetness and creamy vanilla flavours, over hints of oak and spicy liquorice. Ballatine’s is a blended whisky company that began life in its current form in 1865, when Archibald Ballantine began creating his own blends which he supplied to clients including the Hindu Royal Family. Owned by Chivas, the Ballantine’s blend draws primarily from the single whisky malts of Glenburgie distillery, moreso these days after the sale of Ardmore distillery in 2005, which also contributed to the blend. 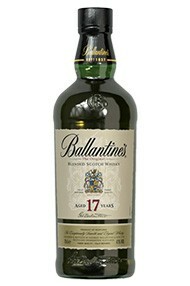 Ballantine’s blends are versatile and popular, enjoyable drunk neat or in a cocktail. Blended Whisky is made from a blend of whiskies from different distilleries. Ireland, Canada, Japan all produce blends, yet the most renown manifestation of this whisky type comes in the form of Blended Scotch Whisky. The term denotes a blend of one or more Single Malt Scotch Whiskies with one or more Single Grain Scotch Whiskies from different distilleries. The typical proportion is 60% grain to 40% malt. The degree of complexity and smoothness in the final blend depends on the percentage of malt. Each whisky used in the blending will normally have been matured for about 5 years, although many other longer-matured versions are also available on the market. The term should not be confused with Blended (formely known as Vatted) Malt Scotch Whisky, which comprises only Single Malt Scotch Whiskies (100% barley), which have been distilled at more than one distillery. 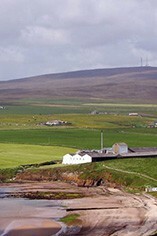 The practice of blending Scots malts trace its origins back to the Victorian times. The original family-run distilleries did not have bottling facilities. They used to sell whole casks of whisky to bottlers, blenders and merchants who then combined the product of various distilleries, to craft a consistent "brand style".